Considering his stature as one of the top swing-oriented drummers and one who uplifted the Count Basie Orchestra of the 1970s, it is surprising that Butch Miles has not led more albums in his career. 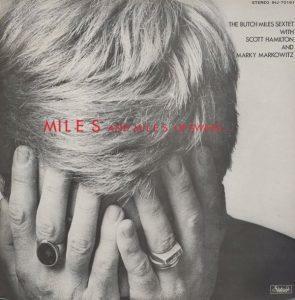 While he led isolated sets for the Nagel-Heyer label in 1994 and 2003, all of Miles’ other records as a leader were for the tiny Famous Door and Dreamstreet labels during 1977-86. Harry Lim of Famous Door particularly enjoyed Miles’ playing, documenting him on as a leader on seven albums of which Miles And Miles Of Swing was the first.. Miles has his share of solos space (being showcased on Basie’s “The King”) but also features his sidemen quite generously. While Hamilton and Cohn appeared on many sessions during the era (and the former is still a regular in the recording studio), Markowitz was heard much less frequently. After serving stints in the 1940s with the Charlie Spivak, Jimmy Dorsey, Sonny Dunham, Boyd Raeburn, and Woody Herman Orchestras, he became a studio and session musician who only infrequently was featured as a soloist. Fortunately Markowitz is on a few of Miles’ Famous Door dates and one of his own, and is heard in top form throughout this CD. Such songs as “Cherokee,” a slower-than-usual version of “Take The ‘A’ Train” and “Broadway” all receive excellent treatment by these swing all-stars, all of whom play up to their high potential. Lew Shaw started writing about music as the publicist for the famous Berkshire Music Barn in the 1960s. He joined The West Coast Rag almost thirty years ago and has been a guiding light to this paper through the two name changes since then as we became The Syncopated Times. He has written hundreds of stories in that time, while also doing much to promote jazz in Arizona and indeed everywhere. He taps his extensive network of connections and friends throughout the traditional jazz world to bring us his Jazz Jottings column every month.